Volkswagen has showcased its e-load Up concept at the Frankfurt Motor Show. Based on the all-electric e-uP, the concept is an exercise is the utilisation of storage. The electric van has a fold-up passenger seat and over 1m3of space in the back, with a range of 100 miles. Volkswagen hasn’t given any indication if the e-load Up will make it into full scale production, but the van presents some interesting food for thought when it comes to the development of the next generation of light commercial vehicles. Powered by a 82PS electric motor, the e-load Up can cover 0-62mph in 12 seconds and is capable of carrying 306kg. Load space has also been significantly increased, from 951 to over 1400 litres. The interface for charging the battery in the e-load Up is concealed under the ‘fuel cap’ and it’s claimed that 80 per cent of battery capacity can be reclaimed just 30 minutes of charging. 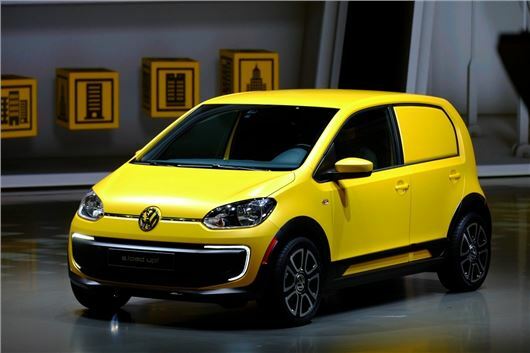 Volkswagen are quick to point out that this vehicle is only intended for couriers or delivery drivers in urban environments, as its lack of range and carrying capacity would make it unsuitable for anything else, but it paves the way for the development of bigger, more powerful vans in the future.